The biggest attractions of the Humboldt Penguin national reserve is to visit the crystalline beaches of Isla Damas and Punta de Choros, in addition to spot colonies of penguins that live on the coast. This reserve, with an extension of 859.3 hectares (1,890 acres), is formed by three islands: Damas and Choros in the northern part of the region, and the Chañaral de Aceituno island, in the southern part. There is a large variety of fauna on these islands, but perhaps their most well-known inhabitants are the Humboldt penguins, endemic to the current which gives them their name, and who nest on these islands. There is also an important colony of sea lions, chungungos, Magellanic penguins, llacas and bottle-nosed dolphins. The latter can be seen frequently around the Chañaral island. In the summer season it is possible to see some more occasional visitors around the islands: marine turtles, dolphins, whales, albatrosses and cormorants. Damas island is the only place that has camping and picnicking facilities and to get there you have to contract the services of fishermen in the vicinity of Punta de Choros cove. Climate : The climate is temperate with abundant morning fog which disappears by midday, and in the summer gives way to an intense sun. The annual rainfall is 30mm (1.1 in) and the average annual temperature is 18°C (64°F). Services : Rangers, environmental information, trails. Administration Post : There is a chief manager at Isla Chañaral and an administrator at Punta de Choros, where you can also find two administrative offices. Phone number: (56) 09 5443052. Entrance tickets : You can buy tickets to sail to Isla Damas from 9:00 to 13:30 and from 14:15 to 16:00. During the high season ticket sales are subject to the maximum amount of people allowed in the island. Campsites : Isla Damas: camping is not allowed at any time of the year. Visits must be made only during the day. There are no picnic areas. 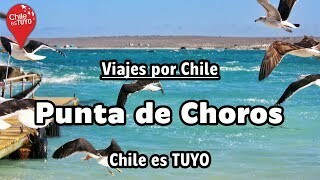 Punta de Choros: there are cabins and campsites offering accommodation services. There are no fresh water sources. Fishing and diving: due to the closeness to the sea you can practice both sports, as long as you have the necessary permits and licenses. Flora and Fauna : There is a varied ecosystem that boasts unique characteristics, especially for its high levels of endemism. There are 59 differente species of vascular plants, such as yellow añañucas, Alstromeria philippi, Eulichnia acida var, and Procumbens amongst others. There are also 68 vertebrate species, amongst which you can find the Marine Otter, South American Sea Lion, Common Bottlenose Dolphin, and the seasonal presence of whales and sperm whales. There is a wide variety of birds, the main ones being the Humboldt Penguin, the Peruvian Diving Petrel, Red-legged Cormorant, and the Guanay Cormorant, all of which are protected species. There are no water streams near the area. The soil is mostly sand. Neruda Apart Hotel offers Furnished and fully equipped apartments located amid the entertaining Providencia neighbourhood.